This harness is complete for a team, but is without collars. It is all made of patent leather in the highlights and the ornaments are of sterling silver and nickel plate. The hames are chromed steel. All parts and lines are included and the harness is in usable condition. This harness is a unique collectors item and bears the crest CIV. 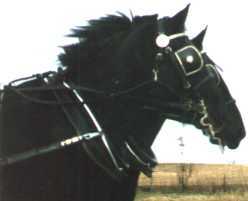 It is a very old harness and very well preserved, having been well cared for over the years. For the serious collector, this is a once-in-a-lifetime opportunity to obtain a very rare and beautiful old harness! Please give us a call for more details or any questions you may have. This is the Pennsylvania Railroad's coach from the Crestline, OH station and roundhouse. Built sometime in the 1880s, this has the forge stamps and numbers. The body was probably a 10 to 12 passenger station-type coach. I have the axels, hubs, all 5th wheel parts, bolstens, reach iron, and some of the body hangers. For the serious collector, there is enough to build an authentic restoration of this coach! A very rare find and one-of-a-kind, indeed.